Step back in time and experience the bygone eras of the early to mid 20th century. Explore the world of pioneers, visit renovated homesteader cabins, climb aboard a caboose and much more. 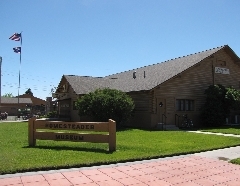 Join the fun at Homesteader Days, the first Saturday after Labor Day. Open Mid-March-May: Tues-Fri 10am-4pm; June-Dec: Tues-Fri 10am-5pm; June-August: Sat 10am-2pm.